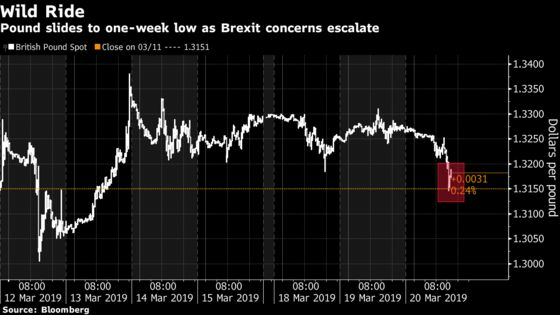 (Bloomberg) -- The pound fell to a one-week low after U.K. Prime Minister Theresa May confirmed she would only seek a three-month delay to the Brexit deadline and reports suggested the European Union may not support her request. Sterling led losses among the Group-of-10 currencies as May told Parliament that she was sticking to her plan to avoid a long delay to the U.K.’s departure from the EU. Gilts rallied for a fourth day as her request was met with skepticism, with European Commission President Jean-Claude Juncker reportedly warning May against including a date for the extension that is after the May 23-26 EU elections. With just nine days to go until the U.K. officially leaves the bloc, May has been barred from bringing her Brexit plan before lawmakers again without substantial changes. Sterling is still the best-performing Group-of-10 currency this year, having strengthened more than 3 percent against the dollar. Despite Tuesday’s decline, demand for protection against undue swings in the exchange rates is still subdued. Four-month implied volatility in the pound is holding near the lowest in six months. The potential outcomes from here range from a delay to an approval of May’s plan. A delay would keep the pound in a holding pattern between $1.30 and $1.35, according to Kenneth Broux, a strategist at Societe Generale SA. A vote in favor of her proposal would send the currency rallying more than 10 percent to $1.45, he said.